Is that reality, as you know it? Well, let me introduce you to life as you don’t know it. In my selling, the words “life insurance” used to be taboo, a kind of plague to stay as far from as I could. Sure, with all the articles about why I should be selling life insurance and how good it would be for me, I gave it a try. And, in return, it gave me heartburn. But then Dan walked into my office. Dan is a potential client who wants a sec-ond opinion. Usually, I find folks who want second opinions to be a waste of time. I expected Dan to be no different—a pleas-ant meeting ending with a courteous note of appreciation, a nice pat on the back and a sincere “think about it” for the future. Bye-bye, Dan. Right? Wrong! After I spend a little time with Dan, who keeps telling me how happy he is and how great he’s doing, I smile nicely and tell him that he should just keep doing what he’s doing because he won’t make any changes—that people who are happy rarely change. So, Dan agrees and begins to pack up. It’s over! At least I think it’s over, until Dan turns to me and says, “Oh, by the way, how come you didn’t talk to me about life insurance?” I was puzzled and told him that it was because no one wants to talk about life insurance, but he said he did. He went on to extol the virtues of life insurance, including the tax benefits and creating tax-free income. It was almost as if I were listening to a life insurance wholesaler trying to sell me. Before I knew it, Dan was out the door and surely going to someone else who would sell him insurance. I don’t like losing business. It’s bad for my ego, worse for my bank account. So, I set out to use the energy of my loss and put that energy into turning my lemon into lemonade. Today, my world is filled with life insurance sales I never thought possible. These sales enhance my core business of repositioning assets into annuities and assets under management. To help you fill your world with life insurance sales also, I’ve outlined some steps that, if you commit to their implementation, you will find quite profound… and rewarding. Make up your mind to never (notice the word “never”) let negative thoughts from the past influence your thinking. If your mind convinces you that life insurance is just too tough (or whatever), then for you, it will be. When you hear these thoughts, treat them like a bad relationship; don’t listen—no matter what. Life insurance solutions can be broad and overwhelming. Instead of trying to be all things to all people, identify the selling opportunities that, when you see them, make your life insurance antennas vibrate. Repositioning of taxable assets into a product that passes income and estate tax free (placed in an irrevocable life insurance trust, or ILIT) and essentially removes the asset from the tax system. A death benefit that guarantees lever -aging up in value of the repositioned asset and can recoup any taxes paid during the repositioning process. The ability to build large amounts of cash value that in the future may be used for emergencies or to create tax-free income (the max funding concept). Purchasing an annuity with a lifetime income rider to pay the premiums. Rolling out the entire IRA over a specific period of time, e.g., 10 years and purchasing a 10 pay life policy. Using required minimum distributions that are not needed for income to purchase the policy. As you can see in the chart on the opposite page, rolling qualified money into max-funded life insurance provides clients with tremendous tax savings and leveraging possibilities over and above managing their IRA traditionally or converting to a Roth IRA. This chart says it all. If my client continues to manage his IRA traditionally, he and his heirs will pay $549,945 in taxes based on taxes on RMDs, reinvested RMDs and taxes to heirs (estate taxes not included). The ending balance to the heirs will be $1,393,513. Moving to a Roth offers considerable tax reduction and an increase in the ending balance to the heirs. 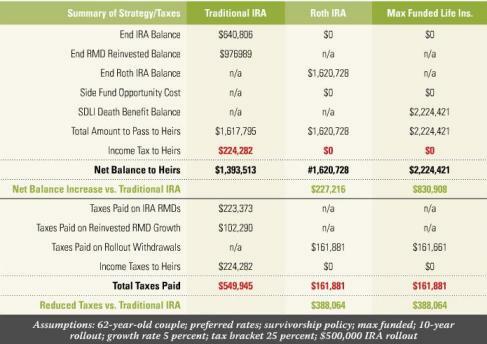 Converting the IRA to specially designed max-funded life insurance shows an even greater benefit to the heirs and similar tax reduction as in the Roth conversion. Moreover, although the numbers aren’t shown here, the policy can be designed to build a substantial amount of cash value, which can be used for tax-free future income or emergency needs. Benefits similar to those derived from an IRA rollout can be derived for clients that have old annuities or annuities earmarked to pass to heirs. Tax-deferred assets are converted into nontaxable assets, lever-aged via the death benefit and passed to heirs tax free if set up properly. Here, I use annuitization options and lifetime income riders to pay the premiums. For younger clients (especially boomers), I identify funds that they would normally devote to their 401(k)s (I like to use all of their contributions over and above the company match) and use those funds to purchase max-funded life insurance, the cash value of which will provide them with tax-free income when they retire (this can be illustrated right in the life summaries) and will provide, just in case, some death bene-fit for their families if they should pass early in their lives. The tax-free income is derived from the borrowing privileges built into the life insurance policy. I use policies where the borrowing of funds does not deplete the cash value of the policy. Most often I use indexed universal life or mutual whole life. So the interest charged on the loan is often offset by the growth in the cash value. Essentially, the funds are used at a minimal or zero interest rate and, because they are characterized as loans, they are not taxable. And, by the way, if you’re thinking that your clients are too old or not healthy enough, think again. If clients are uninsurable, no problem. Rollouts of all kinds can be successfully designed around a sin-gle healthy partner or even another family member (son, daughter, etc.). Remember, no one, at first glance, is standing in line to buy life insurance, and clients generally have a visceral negative reaction to it, so you still have to be careful when you use those words. In either case, I then tell my client, “John, this strategy employs, in a very special way, the use of life insurance. Is that a total turnoff and I shouldn’t even bother, or will you stay open-minded with me?” When approached this way, most people will keep an open mind. Getting life insurance into the planning process allows advisors to pick up a substantial amount of income and earn a deeper level of respect from clients. Advisors will also strengthen their business by providing an option that is resistant to changes in the market, the pull of your prospect’s current advisor, economic ups and downs, and shifts in compliance, all of which can heavily affect advisors’ ability to reposition assets into annuities or assets under management. Steve Lewit is founder and CEO of Wealth Financial Group, Buffalo Grove, Ill. Steve designs, tests and scripts all the public educational seminars for Wealth Financial Group and has developed a reputation as the leading innovator of educational seminars in the industry.